PLMA members must sign in with an authorized user account to receive member rates or apply a member pass. If you are not a PLMA member, click on register and follow the directions to create a free user profile to receive the non-member rate. Registration includes one admission to Interest Group meetings, all core conference sessions, and sponsor lounge including breakfasts, lunches, hosted reception, refreshment breaks, and post-event online access to proceedings. Attendees who pay the full rate whose organizations are not already PLMA members will receive the incremental registration fee as a membership credit if they join before June 30, 2019. Interest Group Activities. Interest Group activities on May 13 are included with conference registration. Breakfast and lunch provided. Anyone is welcome to attend. See 39th Conference Agenda for details. Demand Response Fundamentals and Evolution Training: Separate registration is required ($195 for members/$395 for nonmembers) (Note: this course is not covered by a member pass). This one-day course explains how today’s demand response initiatives are evolving to interact with an emerging future with distributed energy resources for peak load management and much more. Course materials are provided electronically in advance of the course. Breakfast and lunch provided. This registration is covered by a PLMA member pass when registering for the full conference. Learn more about this course and other PLMA training at www.peakload.org/demand-response-training. This business meeting with working dinner is only for Board members and At-Large Representatives listed at www.peakload.org/plma-leadership No charge to attend. Planning to register multiple attendees? Consider a sponsorship that includes free conference passes. Academic Members receive 50% off the standard member rate. See peakload.org/join-plma for membership details. Scholarship: A limited number of scholarships are available. Applications must be received by April 15. Download the application HERE. Lodging is not included with registration. Make sure all your attendees have time to book a room. Register online at: www.radissonblu.com/reservation/itineraryEntrance.do?pacLink=Y&promoCode=PEAK19&hotelC%20ode=MPLS_DT and use the promotional code PEAK19. If you receive a sold out message when trying to book, try a different set of dates, as the pre- and post-days may sell out earlier than the main conference. If that happens, access the booking window on their main webpage www.radissonbluminneapolis.com, choose the event dates (May 11-17, 2019), and use the promotional code PEAK19 or call the hotel directly at 1-612-339-4900 and ask for the Peak Load Management Alliance Spring 2019 Meeting room block. Breakfast and lunch will be provided each day along with some light refreshments and two receptions. Dinner is on your own. Minneapolis–Saint Paul International Airport (MSP) the closest airport. Ground transportation details at www.mspairport.com/directions/ground-transportation. Parking: On-site self parking is available at the Radisson Blu. Parking fees apply. 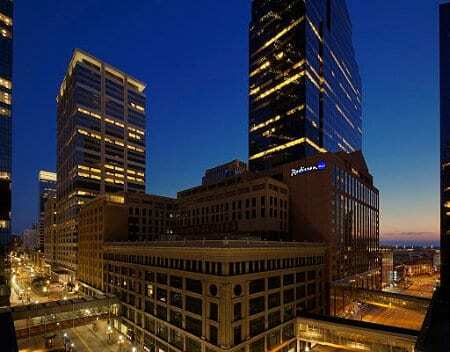 Nicollet Mall and the 5th Street light rail train station are only two blocks away. Taxi transportation to and from Radisson Blu is approximately with fares averaging $39-$49 for one passenger. All attendees or others who interact with attendees must comply with PLMA's Code of Conduct posted at Policies as it may be updated from time-to-time. Two of these policies are highlighted below, but are not the entirety of either policy or the Code of Conduct. You are encouraged to review the Code of Conduct in its entirety, and ensure you and your organization are in compliance during PLMA Events. A few key highlights are noted below, but do not represent the full text of either policy or the Code of Conduct. Anti-Harassment Policy: PLMA is dedicated to providing a harassment-free experience for everyone, regardless of gender, gender identity and expression, age, sexual orientation, disability, physical appearance, body size, race, color, ethnicity, political position, or religion. Conference Promotion Policy: PLMA recognizes that one of the benefits of a PLMA Event is the interaction among the attendees and the open environment provided. It is the intent of PLMA that participants attending PLMA Events be allowed to fully participate without outside distraction. Free Time: You are welcome to conduct your own special events or meetings that do not compete with PLMA agenda time. To make meetings more accessible, and still allow registrants to get the most out of learning and networking opportunities, PLMA has provided the following times for Sanctioned Sponsor Activities (see Conference Promotion Policy in the Code of Conduct) or other activities. Tuesday, May 14 and Wednesday, May 15 - the agenda will include a 90-minute lunch. Food will be served during the first 30 minutes, and free time is available the last hour for their own activities until the sessions resume. Tuesday, May 14 - the networking reception will be scheduled for two hours. Food will be served during the first hour, and free time is available after the first hour. Wednesday, May 15 - ULME's Networking Dinner Ends is scheduled to end at 8:00 pm, and free time is available after that may begin their activities after that time. Thursday, May 16 - ULME's agenda ends at 4:00 pm and free time is available after that time. Read the PLMA Code of Conduct posted at Policies. Photographs are taken throughout the event, and professional portraits are offered as complimentary service. Photographs will be posted as conference resources. By completing registration you agreed to have your photograph taken and all such photographs may be used for PLMA promotional purposes. You may use your photographs for your own purposes and agree to not use photographs of others without their express permission. Visit the Frequently Asked Questions page or contact [email protected].